Chalk one up for the good guys in Florida’s battle against invasive species. Like stucco-eating Giant African Land Snails, the non-native pythons and constrictors that are regularly being found in the Sunshine State are a big headache for wildlife management folks and aren’t nearly as rare as a snake with a foot. However, contractors for the South Florida Water Management District made a huge catch in the Everglades of western Miami-Dade County on Thursday. It comes almost exactly a year after the death of the longest snake in captivity and must have played out like a scene from Bambi’s personal horror movie. I’m sure the soundtrack playing in the background had a menacing bass line, something akin to the increasingly rapid “duh-na, duh-na, duh-na, duh-na” from the movie Jaws. A near-record giant Burmese Python was found. Nearly as ominous as the 15.7 feet in length was the huge bulge in the middle of the predator indicating a recent kill. 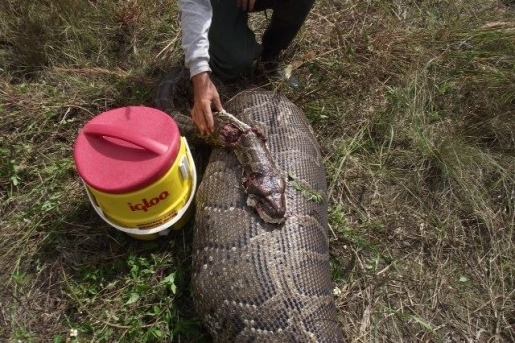 After slaying the beast, Skip Snow, a biologist and python specialist at Everglades National Park, performed the necropsy that revealed a 76-pound deer intact in the python’s gut. 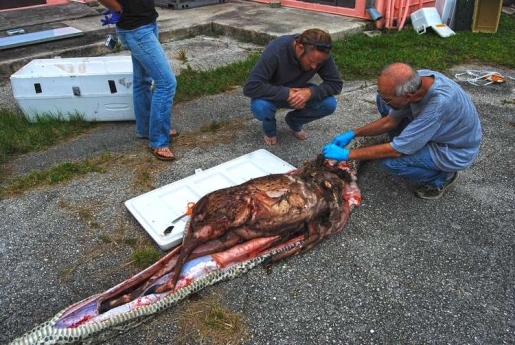 It was the largest intact prey ever found inside a snake in Florida. The bulge created by the deer caused the snake to stretch in circumference to a massive 44 inches. This is a monster snake on par with the giant rattlesnake killed in a St. Augustine, Florida retirement community, although that behemoth was a native species.